Day 2……St. Louis and the Cat Has Already Struck….lol…. – …………. ''AND LET THE FUN BEGIN''……………..
Day 2……St. Louis and the Cat Has Already Struck….lol…. First I want to Thank my kids and Connie (Rich’s sister) for everything they have done. Now that we look back on the last few days, we wouldn’t have left on time without them helping. All 3 kids have been troopers about this from the beginning. I have read some posts from people who want to do this but their families won’t let them. Isn’t that just so sad. Ours have been nothing but supportive. In fact they are cleaning up the house for us now that we are gone. How do you cook Thanksgiving on Sat and then leave on Sunday and expect the kitchen to be cleaned out. Not possible. So the girls and Connie are going to go over and finish cleaning out the frig and the cabinets and take the trash and haul what ever to the dumpster. Isn’t that amazing. We have the best kids. They just wanted us to get on our way. THANK ALL OF YOU SO MUCH. It was becoming so chaotic, we didn’t think we would leave. We were so glad to see you Tina, Ed, Connie, and Brian on Sunday. Monday we stayed at a truck stop. Its usually safe their, just noisy. But I don’t mind. We finally started getting dressed around 8:30. Rich had taken off his blue sweat pants the nite before and dropped them by the bed. He was looking for them and couldn’t find them. His wallet and money was in the pocket. Now come on—–How do you lose sweat pants in a space of a camper. We looked and looked. Tore the camper apart. Looked in the shower where we had put all the excess clothes that we never got put away…..Tore the bed apart again….Looked under chairs….under the sofa….Cabinets….bathroom….EVEN THE FRIG AND FREEZER……Now the outside door was locked and Rich knew nobody could have come in a stole his pants from the side of the bed…..Think….Think….down on hands and knees….Into the back closet….NOWHERE……by 10 we just didn’t know what to do….Finally….WE FOUND THEM………..We didn’t put the bedroom slide out, so right by the bed is a cubby hole that must go back quite a ways….He was down on his hands and feet and looked in. Put his hand in and touched something…..HIS PANTS…..The CAT HAD DRUG THEM IN……hahahaha…..OMG…..Funny…and what a Relief….So Now the Morale of this story is…….Probably better always know where the cat is when putting slides out or in…..Kitty may be underneath and be squished….lol. Finally by 10;30….ON THE ROAD AGAIN…. After that we headed down the road and stayed last nite right outside of Little Rock Arkansas. OMG the weather is getting warmer. Went in to the truck stop and didn’t even wear a coat. The sky is blue and just a few clouds. So on down the road we went and tonite we are in Nacogdoches Texas. Well we stopped at this Good Sam approved campground, cause we want to take showers in the morning. Well, she asked me if I was a Good Sam member. “NO”. She said, Ok its still just $27. So I gave her a 20 and a 10. She said do you have anything smaller…”NO”….I looked in my pocket and pulled out 2 $1s…..She said Ok….This is fine…..She took the 20 and the 2 $1s….total $22…..What a deal. and Free Wi Fii. Well then we went to see the showers…..A little green building…..One door….the sign is a pic of men and women…..?…..Well we went in. ITs just one big room with 3 showers and 3 pottys. They do have shower curtains and doors on pottys, but REALLY….the outside door locks with a little broken chain. It a chain for a pole light I think and its broke and is kept together with wire….So the is what GOOD SAM is all about?…No wonder I’m not a member. So tomorrow we will take turns guarding the door….Just gotta have a shower…..Can’t wait to DE winterize the motor home so we have our own shower.. So far its been a blast but on a sad note. Yesterday as we were looking for Richs pants , we looked in the Dryer. Their was this little stuffed Mouse that has been on the kids bed in our house for years. 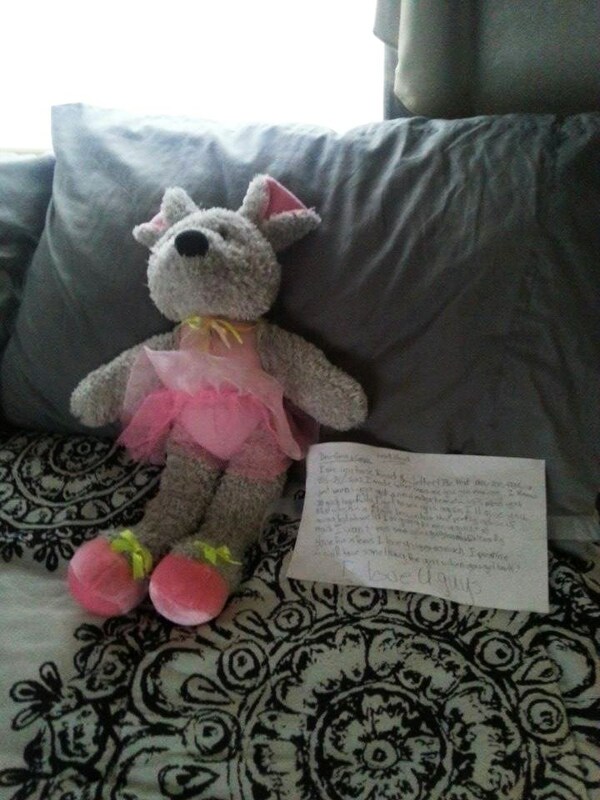 Cassidy, my 10 year old granddaughter had hid him in their and wrote a note. It was about how she missed us….It made me cry….I think it was a Reality Check. I know it will pass, but it really was a weak moment for me. So now this little mouse will sit on our bed daily and be our friend. Tina posted a picture of herself today on FB….so so FUNNY…..It was snowing at home….OMG…We left just in time. What a face. Also Miley had her Thanksgiving day feast at School…. So off to the showers in the morning…..lol…Hope all goes Well…. ← Thanksgiving and Finally…..DAY 1…. We Are On the Road….Heading For Sunshine…. OMG! That cat story cracked me up!!! I was wondering where in the Hell a cat could hide a pair of sweat pants!?!?!?!?!?!?!?!?! I’d like to say I’m hating the weather here, but every day I don’t have to bundle up in boots, layers, a bullet proof vest and more layers. I run out to my car and into my office at work. LIFE IS GOOD!!! I can’t wait to see more pictures!! Keep them coming! Wow, what a nice blog. We have eaten at Lamberts many times. Try staying at a Cracker Barrell overnight sometime. They are great too. Laughing, glad Rich found his pants and the cat. I guess we could call it the “cat burglar”.